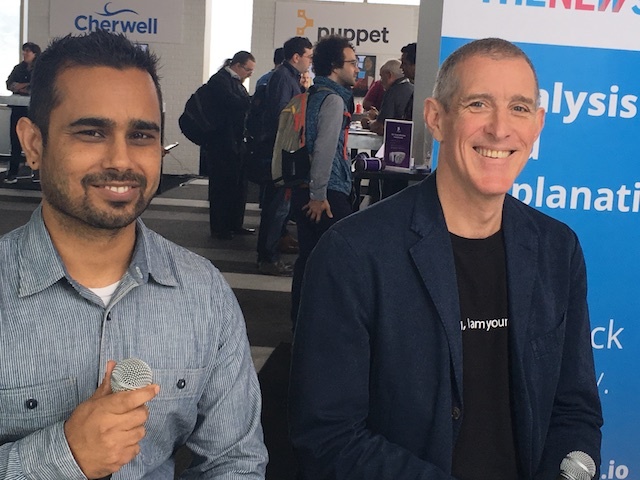 With the continued evolution of machine learning, organizations may no longer need an absolute strategy for which data they’ll collect from their servers, with respect to performance, notes Chief Technology Advocate Andi Mann of Splunk, which offers a data collection platform in use by many DevOps professionals today, speaking in this latest edition of The New Stack Makers podcast. Mann was joined at PagerDuty Summit 2017 by JT Giri, CEO of cloud migration consultancy nClouds. Giri deals with organizations making a move to Amazon Web Services, and comparing AWS’s native features to what they can achieve in hybrid cloud deployments with the open source Kubernetes container orchestration engine. More and more, these two worlds are meshing with one another, and the differences between the two platforms are less clear-cut. PagerDuty SaaS-based digital operations management platform empowers developers and DevOps teams to resolve business-impacting incidents. From aggregating events to correlating them into incidents, PagerDuty orchestrates the incident response process by reducing alert noise and resolution times. 4:27: Advice for migrating to the cloud. 8:34: Data gathering for cloud migration. 15:52: Amending the canonical definition of DevOps to streamline service delivery to customers. 21:40: Exploring the continued separation of organizational roles while still needing specialists. 29:13: How existing systems should be moved to cloud-based infrastructure. 36:16: The DevOps finish line. PagerDuty is a sponsor of The New Stack.